The holidays are over, but that doesn't mean that the fun has to end. Keep that cozy, holiday spirit alive by spending time with your loved ones, including your four-legged friends. There are plenty of fun winter activities you can do to make you all feel like the holidays are still here. 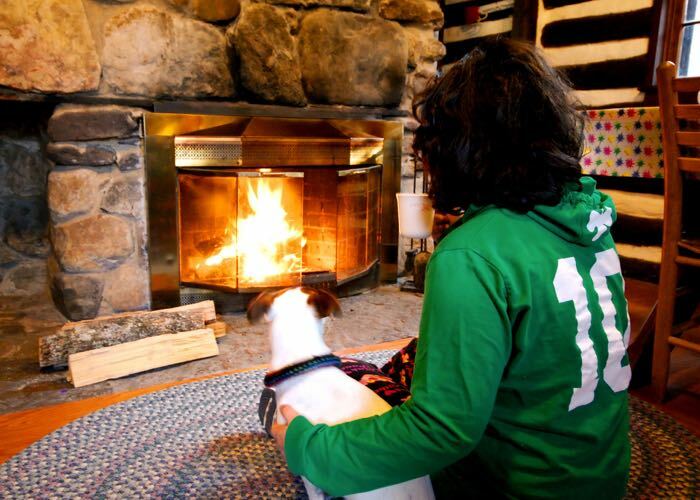 Snuggle up by the Fire When the temperatures drop, there's no better place to be than in front of a warm fire with your furry sidekick. Just remember to use a fireplace screen to protect your pets. Go Play in the Snow Play fetch with a brightly-colored ball or toy that won't get lost in the snow. Your pup will enjoy the soft snow, but be sure to dress him accordingly in a warm sweater, jacket and booties. Appreciate Apples Bring back the feel of the holidays by sipping a warm glass of apple cider. While pups and kitties can't have cider, they can have a few small pieces of yummy apple. Just be sure to remove all of the seeds, which are toxic for pets. Cook up Some Holiday Favorites Nothing tastes like the holidays like turkey, ham or chicken-and-apple sausages. The smell alone will keep that festive feeling going in your home. Don't forget to include your pup in your festivities by giving him some Milo's Kitchen® Chicken & Apple Sausage Slices dog treats. Use an Electric Blanket An electric blanket on a chilly winter day is the very definition of "warm and cozy." Get a heated pet bed so your furry friend can be comfortable, too. Give Your Family and Pets Gifts Even small surprises, like treats and toys will please both four- and two-legged family members, keeping the holiday spirit alive. It's like December all the time. Sleep In You love sleeping late during the holidays, but that doesn't have to stop when they're over. Get some much needed rest by sleeping late on the weekends. Make up for the late start with a rousing day at the dog park or some fun play for cats with toys on a string. Enjoy Some Pumpkin You can find pumpkin-flavored everything during the holidays, so bake a pumpkin pie or pumpkin bread to enjoy with your family in January. The best part is that a little fresh or canned pumpkin is safe to feed to your pooch or kitty — just make sure that their portions are low in sugar and free of artificial sweeteners like xylitol or sorbitol. Use Aromatherapy Simmer a few drops of vanilla extract in two cups of water on your stove until your house smells of holiday cookies. For pets, spray some synthetic pheromones around to make them feel calm and relaxed. Sing with Your Family Your neighbors might think you're nuts if you go caroling in January, but you can sneak in some holiday carols at home. Pups and kitties love music, won't judge if you sing off-key and may even join in by "singing" along. Have a Staycation If you usually travel during the holidays, have a staycation at home during January to keep the holiday cheer alive. Take a day off work and plan a special get-together with friends and their pets, or have a spa day at home. Include your furry friend by pampering him with some grooming and love. How are you keeping the holiday spirit alive in your home? Share with us below! Photo Credit #1: "DSC_0397" by Shari F via Flickr. License info. Photo Credit #2: "Douthat fireplace" by Virginia State Parks via Flickr. License info.